Due to funding limitations, we are not enrolling new clients on HEN at this time. Existing clients will continue to receive services. Clients are able to leave their name and contact information with the program, and they will be put on our wait-list. In the event that we are able to resume enrollments, we will make every effort to contact those who were not served. The Housing and Essential Needs Program (HEN) of King County provides program participants rent assistance, utility and transportation assistance, as well as hygiene and cleaning products. DSHS (Department of Social and Health Services) qualifies people for HEN; Catholic Community Services provides these services to King County eligible participants. **Starting March 13, 2018, those receiving the cash benefit program, ABD (Aged, Blind and Disabled) will now also qualify for the HEN program. For more information, please click here. Those located outside of King County, will need to contact the HEN provider in their county for information about the services available. Click here for a HEN directory by county. HEN is not an entitlement program, and program services are subject to funding availability and may be discontinued or reduced at any time. Catholic Community Services can only distribute checks to landlords and/or utility companies. Documentation is required prior to payment. For more information on documentation, please view Documentation Requirements. Qualification for the HEN (Housing and Essential Needs) program is determined by DSHS (Department of Health and Human Services). *Applicants cannot be receiving any other government cash assistance such as SSI, TANF, Unemployment, etc. Earned income and assets will be evaluated by DSHS to determine if resources do not exceed income level guidelines. Applicants must be evaluated and be deemed HEN eligible by DSHS before enrollment in the program. Anyone who thinks they may meet the above criteria should go to their local DSHS office or apply online. The phone is staffed and emails returned during business hours (9 a.m. to 4 p.m.) Monday through Thursday and (9 a.m. to 3 p.m.) Friday. Appointments are scheduled on a first-call first-scheduled basis. All new enrollees must attend an intake appointment before services are provided. Appointments are scheduled with HEN Coordinators located in seven DSHS offices: Belltown (downtown Seattle), White Center (Seattle), King North (at North Seattle Community College), King East (Bellevue), Kent, Federal Way and Auburn. Due to the volume of clients served, we cannot accommodate walk-in clients. To schedule an appointment, or for further information please call the intake line at (206) 328-5755 during business hours. We also can be reached via e-mail for questions. Evaluation of the amount of combined monthly rent and utility assistance will happen at the intake appointment. For more information, please call 206-328-5755. One-time move-in assistance including application fee assistance may also be available depending on the type of unit and the relationship with the landlord. Documentation of formal rental relationship is required. For those behind in rent and or utility payments, assistance may be available on a one-time basis. HEN cannot provide ongoing rent/utility payments for those households living in subsidized housing as defined as public housing (SHA, KCHA or RHA buildings) or those receiving a section 8 voucher. Clients may be eligible for limited past due utility bill assistance. Contact the HEN program to find out more. HEN cannot provide utility assistance or mortgage payments for homeowners. To receive transportation or essential needs, schedule an appointment (206-328-5755) or attend the weekly Essential Needs bank. Transportation and Essential needs and are subject to availability and funding. Must be deemed incapacitated by DSHS. Have Government issued photo ID. For rent assistance, provide either a lease, rental agreement, Pay or Vacate Notice, Eviction Notice, or a completed Certification of Payment Obligation from your family/friend. The person to whom you pay rent must also submit a W-9 form. Click here to download the W-9 form and have the person to whom you pay rent fill it out and sign it. Landlord Habitability Standards Certification. Only required if homeless or moving into new housing while on the HEN program. Pay or Vacate letter from landlord indicating you must vacate housing if payment is not received in 14 days. Only required if housed upon entry to the HEN program. To receive utility assistance for electricity, natural gas, propane (or other alternative heating sources), water, sewer or garbage, you must provide a utility bill, a utility shut off notice or late payment notice. We cannot assist with telephone, cable or internet bills. If you are asking ONLY for utility assistance and NOT rent assistance, the utility bill must be in YOUR name. Only limited assistance is available for those who do not also have a rental obligation. 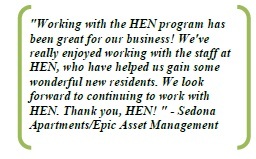 The HEN program works with over 3,000 landlords to provide housing to clients. Landlords are private businesses, non-profit housing providers, and or friends/family members. Receiving payment through HEN is easy. We need a copy of your W9 form, a complete rental agreement* or an Intent to Rent** letter and a Landlord Habitability Standards Certification form. Statement that payments will be refunded if tenant does not move in. **Accepted in the case of new rentals where the Landlord is requiring that deposits and -first month’s rent to be processed before move in. Lease must be submitted within 30 days after letter. *HEN has the discretion to approve or deny payment to any rental agreement or lease. Unlike a Section 8 voucher, HEN rental assistance is temporary. Monthly HEN rental assistance is provided to participants as long as they are enrolled in the HEN program. HEN can only guarantee monthly payments 90 days at a time. At some point, it is expected that HEN recipients will need to begin covering rental assistance with their own resources. HEN program conducts random inspections of rooms or apartments of program participants. Living spaces must meet basic standards in order for participants to be able to receive funding for their room or apartment. For those who are currently enrolled in the program and have already attended their initial intake appointment are able to come to the weekly, walk-in basis Essential Needs Bank. No appointment is required. This is held every Wednesday from 1:30 pm to 3:30 pm at the Catholic Community Services Randolph Carter Center located at 100-23rd Ave S. Seattle, WA 98144, and from 1 pm to 3 pm at the Catholic Community Services Kent Family Center back building located at 1225 W. Smith St, Kent, WA 98032. Clients must bring their government issued ID in order to be served. 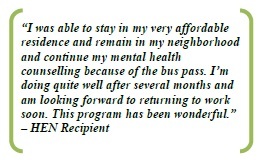 Clients can pick up essential need items one time per month and transportation assistance every other month. During the 2010 legislative session, the Washington State Legislature decided to end the Disability Lifeline (DL) cash grant. In November 2011, people who were receiving financial assistance through the Disability Lifeline program no longer received that money and were eligible for assistance through the HEN program. People continued to receive medical coverage through a program called Medical Care Services (MCS). Funding for the program is strictly provided by state funds and reviewed during the legislative budget review process each year. It is currently funded through 2014, however, level of funding may fluctuate depending on demand of program. Starting January 1, 2014, all HEN existing clients will be eligible and automatically enrolled in Medicaid and their health coverage through Medical Care Services (MCS) will end. HEN participants will still need to comply with DSHS incapacity evaluations and/or reviews to remain eligible for HEN. Staring March 13, 2018 The Washington State Legislature passed HB 2667 expanding HEN services to clients receiving ABD assistance, and expanding qualifications for HEN to those with only Substance Use Disorders (SUD). Does a New Client appointment mean I am on the HEN Program? No, the initial appointment is a screening to see if you meet the HEN qualifications. If you do meet these qualifications, you will be enrolled in the program at that time and assistance will become available. Can I get a check the day of my appointment? No, checks will not be issued on site. All checks will be mailed to landlords or utility companies. I was just cut off benefits, can I still get money? You must currently be enrolled in the HEN Program to be eligible for this funding. Can I get housing assistance more than once? Yes, as long as you remain enrolled in HEN you can access rent and utility assistance. I am homeless and don’t have housing can I get assistance? You may be eligible for transportation assistance, and/or hygiene and cleaning products. Your Coordinator will discuss options for housing search assistance. Will my friend or family member have to pay taxes on the rent paid to them? Possibly; your friend or family member may call the IRS at (800) 829-1040 to ask about how these payments may affect their taxes. If they receive government assistance, it may also affect those benefits. Can I walk into the DSHS office without an appointment to get a new ORCA card or gas voucher from a HEN Coordinator? No, you must call the intake line (206) 328-5755 or click here to send an email to verify you are eligible for a new monthly ORCA card or gas voucher and reserve an appointment with your Coordinator. If I am receiving rental income, will a 1099 be sent out at the beginning of the new year to file with my taxes? No, the IRS no longer requires HEN to send 1099 forms to those receiving rental income. Please go to the IRS homepage and select the Schedule E form to report this income. If you do not know how much your income was over the previous year, call our Intake line for assistance. Working together to reduce poverty in our communities! 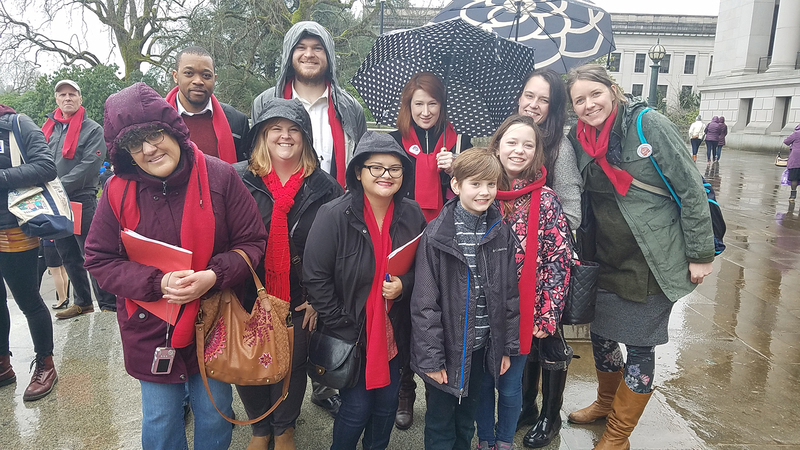 Housing and Homeless Advocacy 2018 in Olympia. HEN staff and clients talk with legislators about the importance of funding for HEN. 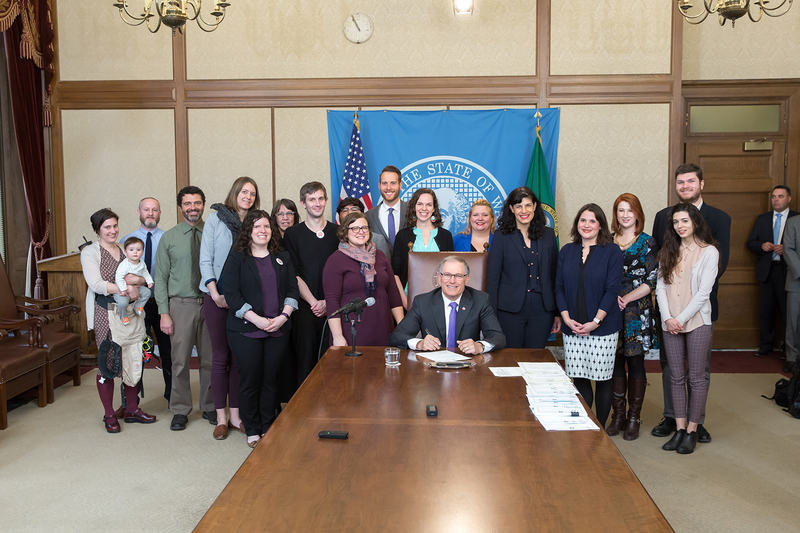 Governor Inslee signing HB 2667 into law! This bill expanded eligibility for the HEN program to include those receiving ABD assistance.